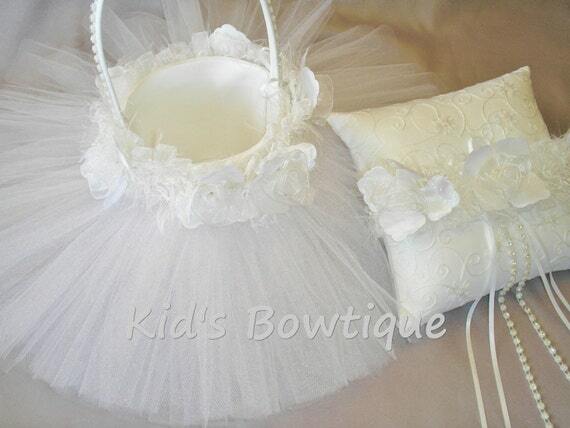 Kid's Bowtique has designed a wedding flower girl tutu basket and matching ring bearer pillow set that is beautiful and elegant for any wedding. Custom Flower Girl Tutu Basket: The tutu basket is accented with a tulle tutu for uniqueness. Pictured is a pure white tulle tutu. We can sew any color tutu on the basket to match your wedding colors. White rose trim is sewn around the top of the tutu for elegance. The handle has a strand of silver beads sewn to it for dazzle (OR you can select pearls). The basket is a standard flower girl basket size (approx. 4.5X5). Matching Ring Bearer Pillow: The matching ring bearer pillow is accented with the same rose trim and silver beads. If your tulle color is changed we can add matching ribbon to the pillow too, upon request. Custom orders are accepted. E-mail us with any questions and/or to create a custom set to match your wedding.